Black Friday is right around the bend and when it arrives, be sure to check out our dynamic list of deals that will be updated throughout the day and following weekend. In the meantime, we're still keeping our eyes peeled for deals, as it's become common to jump the gun. We'll give you heads up when we something worth passing along, starting with today's sale of networking equipment on Amazon. Amazon's "Deal of the Day" isn't a markdown on a single product, but a reduction of up to 50 percent on several networking items. One of the more interesting among the bunch is the Linksys AC5400 (EA9500) tri-band wireless router. It normally goes for $400, but it's currently on sale for $264. That's not cheap for a router by any means, but compared to its retail price, and even its sale price at Best Buy ($350), that might be as low as it gets for quite some time. Incidentally, Newegg also has it listed marked down to $264. 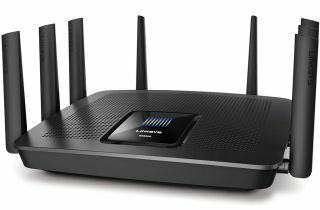 This is a relatively new router from Linksys. It has a single 2.4GHz channel capable of up to 1,000Mbps and two 5GHz channels each capable of 2,166Mbps. Add those together and use some fuzzy math to round up and you arrive at the AC5400 designation (note that you can't actually aggregate multiple channels into a single super high-speed connection). The EA9500 also includes MU-MIMO (Multi-User, Multiple Input Multiple Output) technology. If your client devices support MU-MIMO, the benefit here is that the router can communicate with them at the same time (up to eight streams) rather than rapidly switch between them like most routers. That can help reduce lag and result in less buffering when streaming movies. Go here to see other networking deals on Amazon. There are some storage devices in the mix as well, including a SanDisk Cruzer 128GB USB 2.0 flash drive for $21, an OCZ TL100 120GB SSD for $35, an a Seagate 5TB Enterprise NAS HDD for $189.